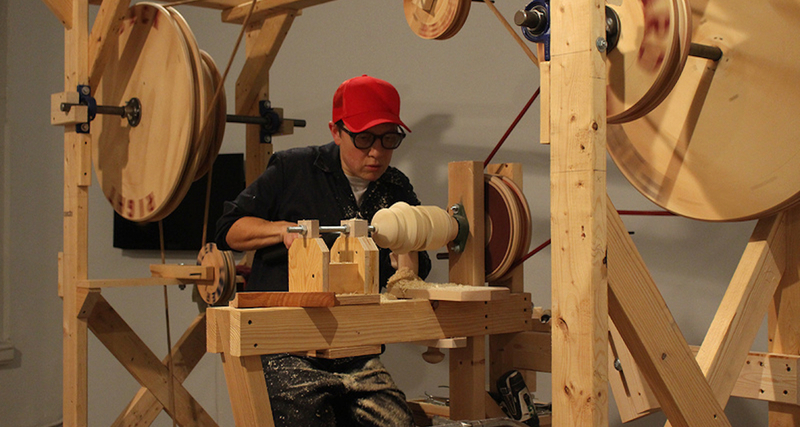 In this durational performance, the artist will activate the sculpture entitled Cycle of Self-Determination, a fully-functional sculptural pedal-powered woodworking lathe. Siepel will be fabricating “continuous profile self portraits” over the duration of the performance. Gina Siepel is an interdisciplinary artist who began her life in a small rural community in the rust-belt region of Western New York State. She is currently based in Greenfield, MA. Her work explores cultural understandings of nature, gender, and American history, through the production of objects and collaborative experiments in public spaces. She has exhibited extensively in the northeastern US, and has received funding from the Massachusetts Cultural Council, the Berkshire Taconic Foundation, the Puffin Foundation, and the Northampton Arts Council. She has been an artist-in-residence at Skowhegan, Sculpture Space, Hewnoaks, and Mildred’s Lane. Gina holds a BFA from SUNY Purchase, an MFA from the Maine College of Art, and teaches studio art at Mount Holyoke College.